This Anglo-American special relationship in silk actually has a third, less well-known Continental acquaintance: the Arny’s tie. 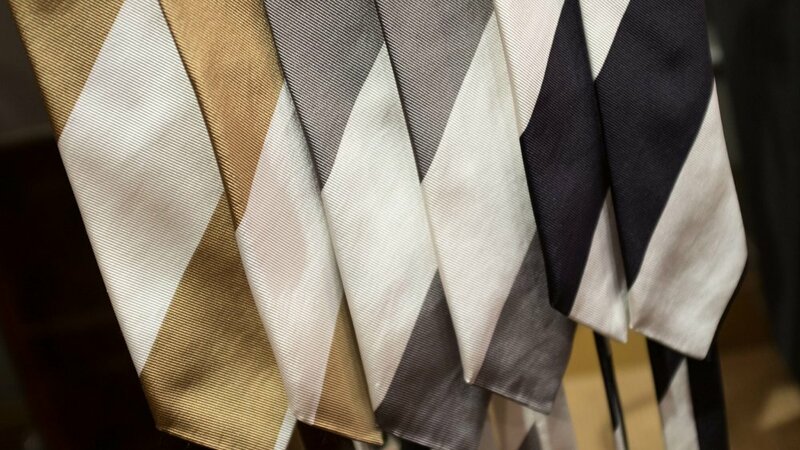 The signature namesake of what had been since 1933 one of Paris’ most whimsical and storied men’s boutiques, these ties carry decadently bold stripes two or three times wider than those found on their English-speaking cousins. If a British regimental is a stiff-upper-lipped old Guardsman, and an American repp is a fresh-faced preppy, the Arny’s tie is a louche French boulevardier, unafraid to turn heads or raise eyebrows. Sadly, Arny’s as we knew it closed its doors in 2015, bought out by fashion conglomerate LMVH and rebranded as a Berluti branch. You can still get a taste of its glory days, however, by picking up one of our Arny’s-inspired ties. Elegant with either a sleek suit or a beater tweed, their simplicity is the height of sophistication. *While our stripes always fall British style (from left to right, harmonizing with the left lapel rolling over the right), our designs (including the Arny’s ties) carry no institutional baggage.